People wanting to remodel or reconfigure their homes are often deterred by the prospect of removing or “moving” walls. (In reality, “moving” a wall means demolishing an existing wall, and building another one in a new location). Clients often express worry about the cost of these alterations, fearing an uncontrolled onset of big expenses. “Can we use the existing foundations?” is a frequent question, new foundations seen as emblematic of nightmarish construction costs. These fears are not unfounded. Stories of runaway remodeling expenses are rife and popular, and there are many cases in Los Angeles where the cost of removing and reconstructing a wall is indeed serious. There are several reasons for this. First, many residential areas in the Los Angeles region are located in hillside zones, some of which have unstable or unsuitable earth. These situations often require deeper, more extensive foundation work (unless stable bedrock is found very close to the surface). Malibu has some of the more extreme cases, with some foundation piers (or caissons) extending 30, 40 or even 100 feet into the ground. Any project in Malibu really needs careful evaluation of the soils conditions very early in a project’s life. Second, multi-story houses often use walls on lower levels to support upper-level parts of the house (so-called “bearing walls”; a grave misnomer better applied to masonry construction than to wood). In these cases, some new double-duty lower walls may indeed need stronger foundations and structure in order to maintain support for upper levels, and sometimes provide earthquake resistance as well. But most cases in Los Angeles, mainly those involving single-story homes, have conditions where removing and reconstructing walls results in relatively modest additional costs–especially in comparison with the overall cost of a remodel project, and with the benefits that this work provides. In my work, these types of reconfigurations often happen in remodels that affect large portions of a house. Examples include expanding the size of a kitchen, adding a new master bedroom, adding a new bathroom, and so on. In these projects, removing a wall can result in dramatic improvements in a house’s layout and flow, and make the difference between a project’s success and failure. 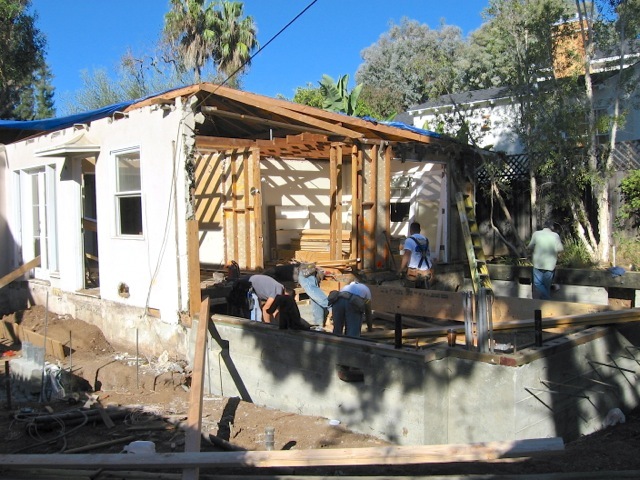 With the typical wood construction of houses in the L.A. area, the cost of some new foundations (especially in a single-story house) and some extra framing for the wall often are but a modest portion of the overall project budget, which is often centered around finish and plumbing costs related to kitchen and bathroom work. For these projects, it is best to focus first on the character of the spaces you want (size, dimensions, functionality and flow), and then work to figure out the most cost-effective way of building them. Sometimes an effort as simple as nudging a new wall’s location by a few inches can make a big difference in cost, especially when new walls are in line with existing ones (making it easier to install replacement beams at the ceiling linking the two). And no, you can’t use the existing foundations for new walls. A new wall will always involve some foundation work, even if it is only to reinforce the existing foundations.